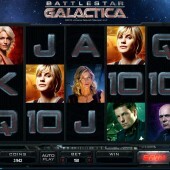 Following the release of the hugely popular Dark Knight slot, Microgaming followed up shortly after with Battlestar Galactica. For those that may not know, Battlestar Galactica was a Sci-fi TV show broadcast around the world between 2004 - 2009. Fans were hugely disappointed when it was taken off the air, but now the show has been immortalized as a slot game. There are clips taken directly from episodes as well as notable sounds from the hit TV series. Several of the main characters can be found on the reels including Captain Kara 'Starbuck' Thrace and Chief Galen Tyrol. 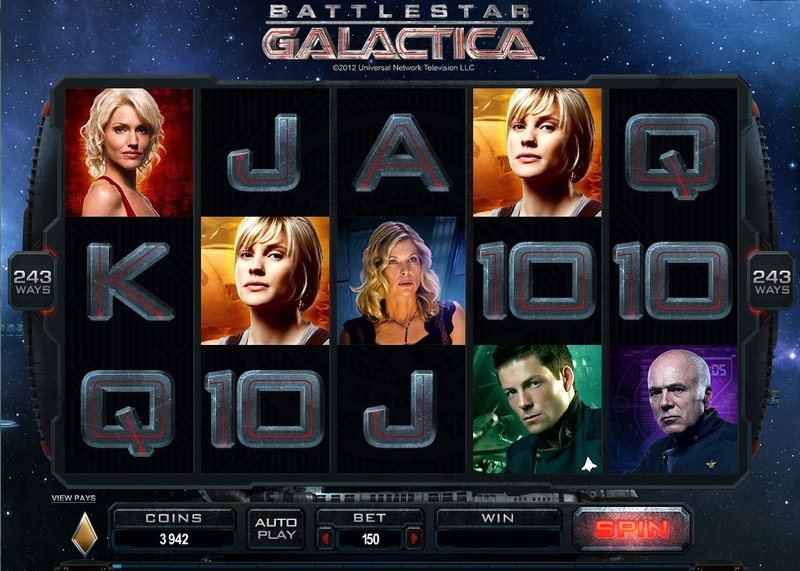 But there is more to Battlestar Galactica than its popular Sci-fi theme, it is packed with unlock features, bonus rounds and various different modes to keep you hooked for hours. Each playing session starts in the ‘normal’ mode, but as the game goes on it will switch into another two possible modes – ‘run’ and ‘fight’. As well as a change in backdrop, you will also get to play for different bonuses. In the normal mode you will get 15 free spins at 3x if you get 3 or more of the fighter craft scatter symbols anywhere on screen. This can work out really well if the stacked wilds on reel 1 come into play. In the run mode there is a special symbol on the middle reel and when it appears it turns all non Battlestar Galactica character symbols to one matching one. The added extra in this mode is that wins pay left to right and right to left. The only downside is that the stacked wilds on reel 1 disappear. During the fight mode the bonus round is triggered in the same way as in the normal mode. You only get 5 free spins, but you can gain extra ones during the battle that commences during the bonus. There is also split wilds, so you can get some huge wins if there are quite a few in place on the reels. Also worth mentioning is the ION feature in the normal mode, which randomly triggers a number of wild reels during your spin. Those that have played the very impressive Thunderstruck 2 will have seen something very similar with the Wild storm feature. It is hard to pick faults in Battlestar Galactica as it is a very well put together game. I have yet to see some very big wins from it and you if you like your slot games super simple to follow then it may not be for you. However, I believe that many players will really enjoy this Microgaming slot which looks set to challenge the likes of IGT’s Against All Odds Star Trek slot and Playtech’s Sopranos.